Step-by-step instruction helping you learn 18 face saving techniques. You'll feel and see the changes! Proven exercises that lift, tone and tighten sagging, droopy facial features on DVD or onDemand. Exercise is natural - nothing harmful or invasive. Exercise gloves and Eye Cream included. 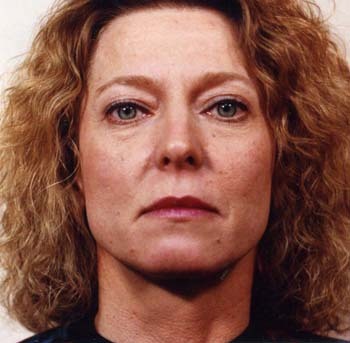 You will look like you again only 5, 10, even 15 years younger. Let me help you create a new face! Everything you need to complete the program and look years younger is in this kit. New! 8 weeks of *FREE* online training is included with this kit - a $50 value. Buy now and get *FREE* shipping! Choose DVD or onDemand. A Message from Cynthia: You can disguise your body flaws with clothing but how can you hide what's happening in your face? 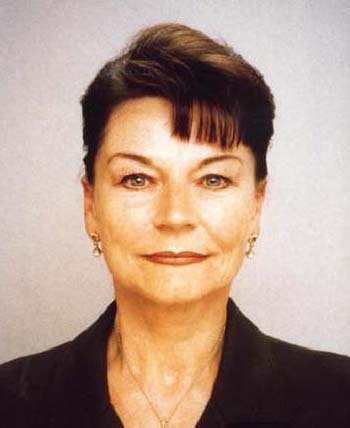 Wouldn't you like to turn back the clock and wear a face that looks 5, 10, even 15 years younger in just 9 to 12 weeks? I promise – you will look better than you have in years when you exercise your face with me! 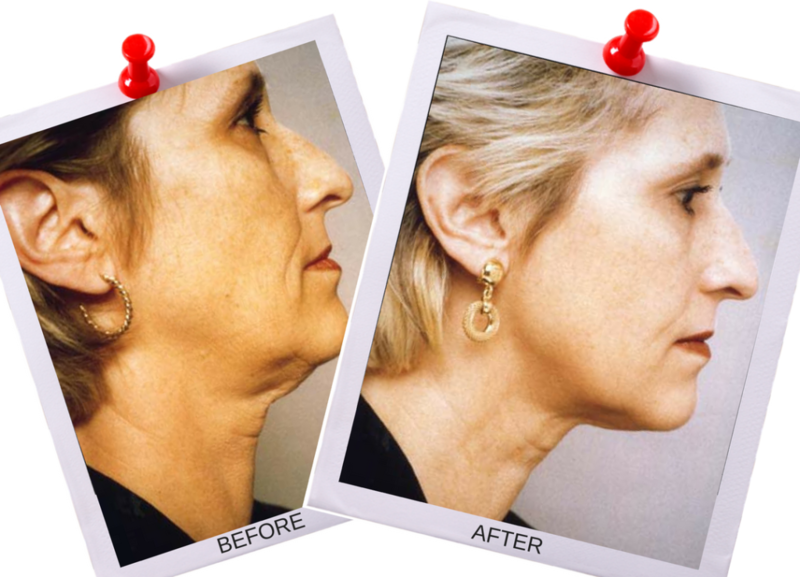 Facial Magic is the best facial exercise program and is proven to provide a natural solution to stop your sagging face and neck. Once you learn the Facial Magic secrets, they are yours forever. Start now! Learn two exercises every week. So easy, each exercise requires 35 seconds so in hardly anytime at all, your face enjoys a quick workout that makes a huge difference in your look. I'm Ready to Begin Facial Magic Now! This is Victoria. Notice the sagging under her chin. Her face is elongating and losing its tone. Even her nose tip is drooping. 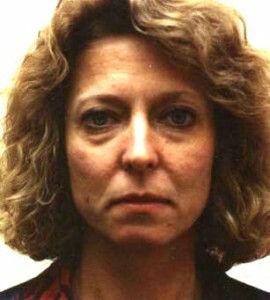 The after photo is a result of exactly 9 weeks of Facial Magic Facial Exercise. Hooded eyes, sagging jowls, double chins, turkey neck, forehead lines and more can be lifted and tightened. Start now! Take close up photos - front and each side today. Put them away, begin the program and compare your noticeable results of a more youthful face in just days. You will love this new face that is developing! Doesn't she look beautiful? And no, she didn't lose one ounce of weight! Her new look was the result of 16 weeks of these fantastic face exercises. 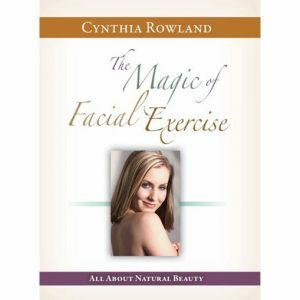 Cynthia Rowland's Facial Magic will do the same for you in just a few minutes a day! You can hide your body with slimming clothes but you cannot hide your jaw line. Let Facial Magic work for you! Get started today! "I am a natural type of gal who would not consider plastic surgery or injections – it's just not an option. I am amazed at the difference I see in my photos and in the mirror! 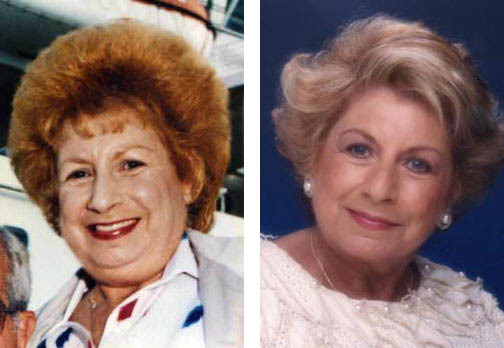 When you look at your face everyday, you may not see the changes but when I laid the photos side by side, they showed how my neck tightened, my lower mouth area looked younger and my skin became thicker, and more youthful looking." 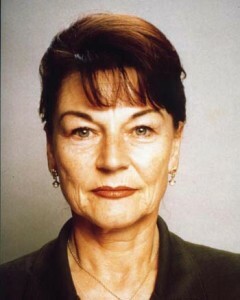 This is Inge, an actress from Los Angeles. She did not like her pouches or her lower mouth. In exactly 9 weeks, those jowls and pouches melted away and her entire face became lifted. 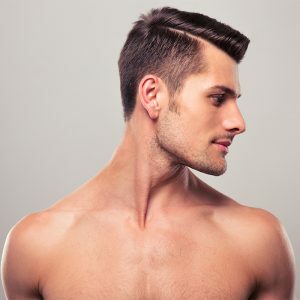 Unlike Surgery or Injections, you will look like yourself, only younger. Your skin becomes radiant, thicker and more youthful. Shapes and contours your face. Tightens and firms double chins, jowls, sagging lids and more. Makes a noticeable improvement in skin tone. Works by lifting your face muscles and tightening skin, without invasive procedures. Reduces appearance of fine lines and wrinkles, revitalizing your skin. Gives you a natural method that is pain free. Results that last to help you look younger and younger every week. 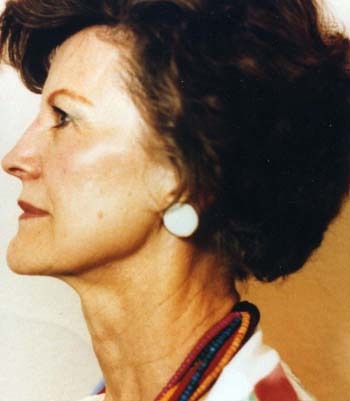 Learn 2 new face, chin & neck exercises each week for 9 weeks from Cynthia Rowland, the original face exercise expert. Our facial exercise is non invasive and proven to lift your face. Learning two facial exercises each week and practicing those movements six days in a row guarantees satisfying results without drugs, electro-stimulation or doctor visits. 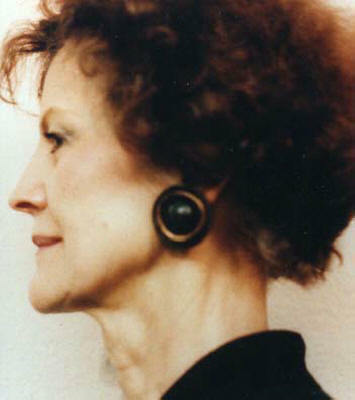 Cynthia Rowland is the original face exercise instructor who popularized it around the world. Twists, scrunches, puckers and contortions will not give you the results you desire. That's why Facial Magic's isometric with resistance movements are superior to other systems and work quickly to lift your facial features. By exercising those tiny, hidden, sagging muscles, your skin will glow from being revitalized with oxygenated blood. The visible signs of aging are reduced. Expect that your face will look years younger. This facial exercise system has been successfully used for years by discriminating men and women. This includes celebrities, royalty, physicians, dentists, proving Facial Magic is the most amazing way to transform your face. The results are apparent almost immediately and lasting results are possible when you exercise just a few minutes a day. You see and feel your facial features improve as your face symmetry and skin tone are restored. 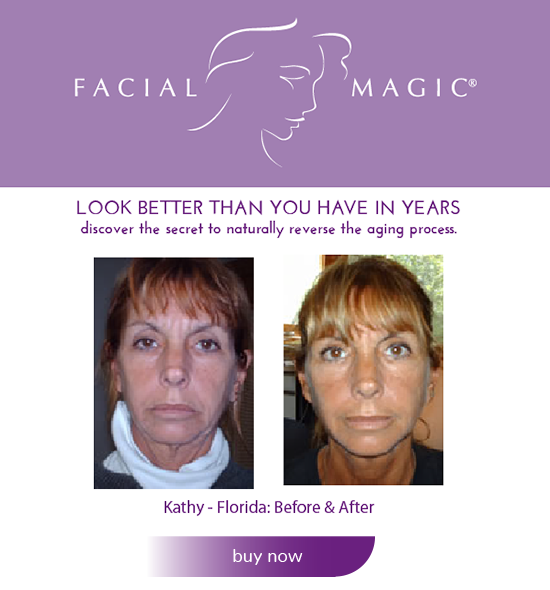 Facial Magic works for everyone. It is safe, fast and effective. The process is easy to learn and the results are astonishing. After 12 weeks. Laugh lines shallower, nose tip not droopy, neck and chin taut! 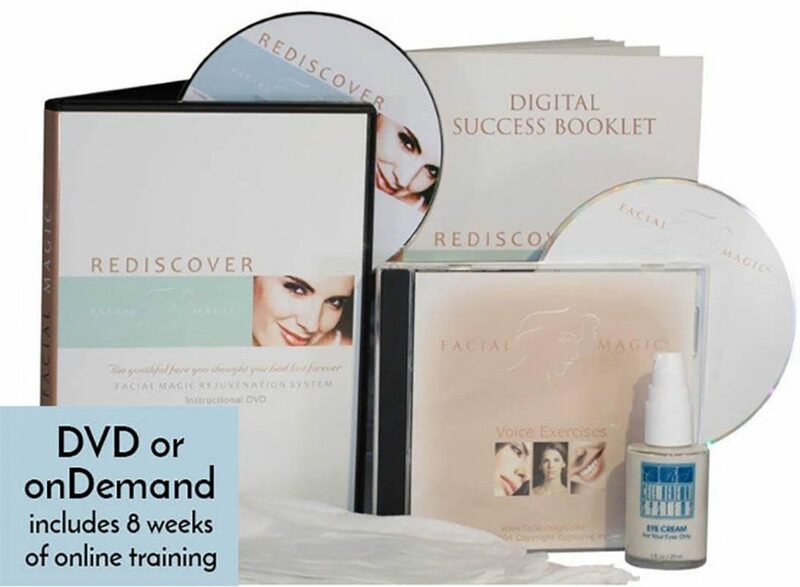 Facial Magic facial exercise system refines, tones, firms and contours sagging facial muscles. Just as exercise tightens and lifts the muscles in your hips and thighs, exercise tightens your facial muscles. Sagging muscles elongate your face as much as half an inch by the age of 55. By firming and lifting these muscles youthful contours return.